The month of the Dubai Fitness Challenge (DFC) is coming to an end, but the admiration and motivation it created within residents towards keeping fit, could last a lifetime. Sheikh Hamdan bin Mohammed bin Rashid Al Maktoum, Crown Prince of Dubai and Chairman of the Dubai Sports Council, challenged Dubai residents on October 2 to do 30 minutes of exercise every day for 30 days - all in an effort to make Dubai the most active city worldwide. The Crown Prince asked residents from all walks of life to accept the challenge - families, youngsters, private and public sector, students, educators and people with determination. Little did we know that a humble request for a daily exercise of 30 minutes would turn into a nation-wide phenomenon. World records were broken, new friendships were formed, people ditched their smartphones and computers for outdoor activities, and, more importantly, residents became active. "The response was amazing. I went to schools and saw young boys and girls enjoying their daily dose of 30 minutes of physical activity. I saw people of determination take part and was left amazed by their enthusiasm. We saw the staff from government entities and private entities embrace the initiative, taking time out from their busy schedules to be a part," Saeed Hareb, secretary-general of the Dubai Sports Council, told KT. "It has been great to see the turnout over the past 30 days and we would like to thank Sheikh Hamdan for launching this noble initiative and then sending out challenges to different entities and personal invitations to individuals, thereby encouraging everyone, without exception, to take up this opportunity to pursue an active lifestyle." Residents weren't just left on their own to carry out their daily dose of exercises. There were loads of activities arranged for them every weekend from October 20 to November 18. 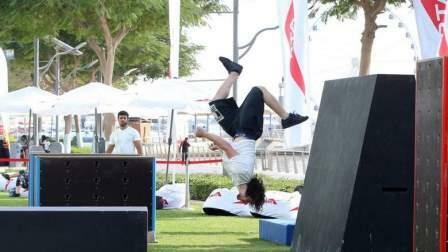 Weekend events were organised at the Kite Beach, Safa Park, Skydive Dubai, Burj Park and Dubai Festival City. All kinds of sports and activities were made available for free for fitness enthusiasts, including basketball, football, group exercises, action sports, kids' activities. Celebrities like Shahid Afridi and Ronaldinho backed the fitness challenge and encouraged people to accept the request. However, the highlight of the DFC month was when Sheikh Hamdan himself attended a few training sessions at Safa Park during the inauguration of the challenge. Other royals who accepted the fitness challenge include His Highness Sheikh Mohamed bin Zayed Al Nahyan, Crown Prince of Abu Dhabi and Deputy Supreme Commander of the UAE Armed Forces, who was seen cycling in an online video; Sheikh Nahyan bin Mubarak Al Nahyan, Minister of State for Tolerance, who was seen in videos cycling and doing push-ups; and Sheikh Mansoor bin Mohammed bin Rashid Al Maktoum, brother of Dubai's Crown Prince, who carried out a range of activities with people with determination. Many world records were also broken by the UAE authorities during the DFC month, including 56 Dubai Police officers who pulled an Emirates Airbus A380 aircraft, weighing 302.86 tonnes along a 100-metre stretch, setting a new world record. Also, 1,455 Dubai policemen came together to set new Guinness World record in burpee. "The Dubai Fitness Challenge has certainly achieved its lofty goals, but this is not the end. Sheikh Hamdan wishes to see Dubai become the most physically active place in the world, so the challenge is still on, especially for us at the Dubai Sports Council, because our collective goal is to see Dubai become a land of health, happiness and verve," Hareb said.